Gaming doesn't get much more straightforward than a top down shooter but it also doesn't get much more thrilling when it's done right. Fortunately, this Japanese freeware title does everything pretty much right, so for fans of The Reap, Raiden and Tyrian, this a bullet-storm game that is well worth seeking out. There's nothing particularly original about Creature Jungle 16, from its minimal sci-fi story and setting to its weapons but that's not so important when it's all put together so well. 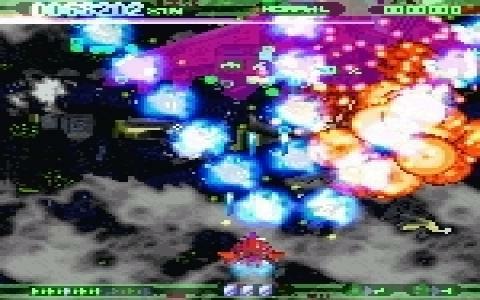 Anyone who has played any of the aforementioned games will be familiar with what's required of them here and all that you need to do is traverse the vertically scrolling levels, blasting the living daylights out of the seemingly never-ending hordes of aliens that are intent on doing the same to you. Of course, there are boss battles to be fought and weapons to be collected and upgraded (where would a shooter be without such things?) but apart from that, there's not much else to describe in terms of gameplay. The graphics are slick and well designed, with some excellent visual effects for the weapons and explosions, while the animation is smooth enough to keep everything flying along at a brutal pace. Sound too is excellent and adds much to the atmosphere and the game's somewhat hypnotic nature. The only potential problem is the game's insane difficulty level, which might prove off-putting for newcomers, with thousands of enemies, bullets and effects filling the screen at any time. However, for the dedicated shooter fan, this is exactly what is demanded so if you think you're up to the challenge, then Creature Jungle 16 makes for a thrilling ride.